To my view, it has always been as hard to make substantial media programs for children as it has been to make successful programs about children’s media. Morgan Neville’s beloved documentary about the TV program “Mr. Rogers’ Neighborhood,” manages to do both and more. The 94-minute feature documentary, Won’t You Be My Neighbor?, not only takes us behind the scenes in Fred Rogers TV set and life, but it also shares potent insights about children, their relationships with adults, and our primal spirit. 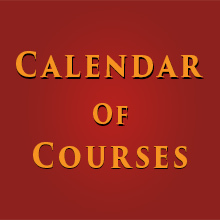 Not many people knew that Fred Rogers was an ordained minister who left seminary to develop a unique form of ministry just as the new-fangled technology called “television” was appearing in affluent Western countries. Few of us also realize that it may well have been Fred Rogers who saved public television in the United States and who studied child development as part of the team which included Eric Ericson and other academic thought leaders. However, I felt this film was about much more than this and the full spectrum of other engaging topics it covered such as race, 9/11, music, children’s TV, and Fred Roger’s hidden traits and trajectory. At the heart of the matter is the matter of the heart–and the heart of this film is about how Rogers opened the hearts of virtually every child and adult he met. In the process of our own hearts are opened and what seems to be a documentary screening experience is transformed into worshipping within a temple. Toward that end, I felt that the total strangers that I was watching the film with became solidified as if family. We all applauded at the end and many sat in silence. My wife and I could not restrain tears more than once and these were not due to the tear-jerking antics of maudlin and manipulative Hollywood melodramas. These tears were induced by the sustained moments of penetrating truth and profound genuineness whether spoken by children or adults. 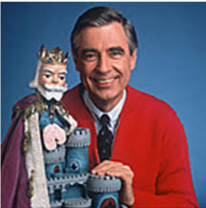 Fred Rogers found a way to drop the mask and be an authentic expression of Divine spirit which drew forth the best from all those he interviewed. He loved silence and thus created space for others to come forth rather than jamming their wavelength with verbosity and pomposity. He seemed genuinely interested in each person with whom he spoke and he could maintain such interest long past the breaking point for most of us. Indeed he made every child (and person) feel special. His stage manager reveals how it would be natural for most media professionals to want to have some of the children who were trouble-makers, especially the “spoiled brats”, to leave the studio. But Fred Rogers included everyone and made even the most difficult children feel special and loved. He not only reached them but he inspired civil behavior and he motivated positive change. Literally, thousands of children thanked him for his inspiration years later when they were teens and adults. Although I am not into hero worship, I could not help but feel I was watching something like a second-coming of Jesus, or the Buddha, or Lao-Tzu or another spiritual leader disguised as an ordinary children’s storyteller–a sheep in worker bee’s clothing. Bible verses such as “suffer the little children to come unto me” and “blessed are the peacemakers” entered my head as I watched the film. I also thought of the Tao’s simple harmony with the flow of life as I watched Rogers exemplify tranquility, non-resistance, fluidity, and humility. 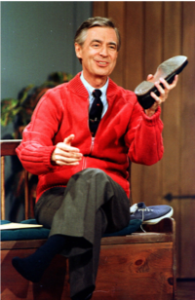 Because he was so gentle and fey, if not fay, Mr. Rogers was sometimes written off as a flake or a fake since no one could possibly be that saintly. And yet, despite his humanness, the off-camera Rogers is revealed to be much the same as his TV image–inclusive, non-judgmental, generous, and above all loving. 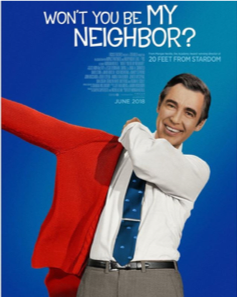 Indeed the film is a love letter to children of all ages and an expansion of the spiritual command to “love your neighbor” and in this case, your neighborhood. It is filmed for folk of all ages and stages and far more than a tribute or biopic. Like the other great spiritual classics, Won’t You Be My Neighbor? is not just a celebration of one life, but the expression of the One Life that we all share–and an invitation to share it deeply with others.